- Fits Thompson Center Encore, Pro Hunter and Endeavor frames. This Pro Hunter XT barrel is 28" long, finished in stainless steel, 209x50 caliber, and fluted like a Pro Hunter barrel. The feature that is unique to the Pro Hunter XT is the Speed Breech XT Breech Plug. 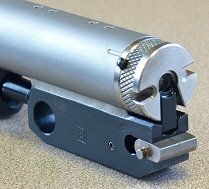 The Speed Breech XT is removable "in-the-field" with no tools... Grab it between thumb and forefinger, twist it 90°, and pull it out by hand! That's especially handy if you forgot to load powder and have a bullet stuck, or if you got your powder wet and need to clear your gun. Just remove the Speed Breech XT breech plug by hand, clear your gun, re-install the Speed Breech XT and you're back into your hunt! - Speed Breech Removal Breech Plug (no Tools Needed). - Swing Away Extractor... Gets out of the way of the Speed Breech. - Premium 28" Fluted Stainless 209x50 Barrel with QLA. - TC Power Rod ramrod with swing out T-handle. - Fully Adjustable Fiber Optic Sights Included. - Drilled and Tapped for scope mounting or PeepRib® Sight System. PeepRib Peep Sight for TC Encore and Omega by E. Arthur Brown Co.